I've got a 5 1/2" square Christmas card for you today. I've used some papers, stamps, inks from Stampin' Up. Owls are all the rage right now so I thought this DSP made a good family of siblings or cousins. I colored the Christmas tree with Stampin' Up markers and then stamped, I'm finally getting pretty good at getting a good stamped impression. This card turned out crisp and clean with just a little bit of glow around the tree. I love that pretty tree and the owls looking on! Thanks, Beverly, for sharing this with us at Merry Monday! 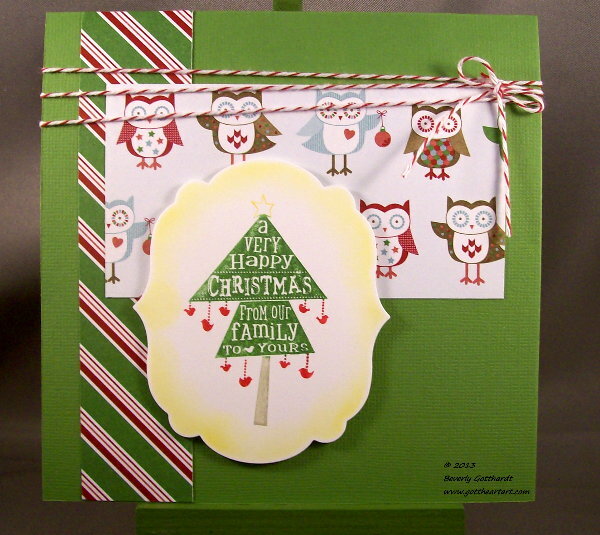 What a fun card, I love your tree and the owls are so cute. Thank you for joining us for Merry Monday this week. Sweet card, love the Owl DSP. Thanks for joining us at Merry Monday this week. Sweet, fun card! So glad you were able to play with the Merry Monday sketch this week! Hi Bev!! Love your card, those owls are adorable!! Thank you for joining us at Merry Monday!